Up to 4 hours of music entertainment. This package is perfect for most wedding receptions. Typically, this allows for the cocktail hour, dinner hour, and 2 hours of Open Dancing. It includes our base sound system and wireless microphone. You may add additional time to this package at a rate of $245/hour. We’ll bring along an additional amplifier, two additional full range speakers, and a powerful subwoofer to provide even more sound reinforcement. We highly recommend this upgrade for events with more than 250 guests. Uplighting has recently become one of our hottest requests, and it’s easy to see why! Proper uplighting can dramatically transform any space! We use all LED uplights, so we can pretty much match any color you choose on the spot! Match the colors of your table linens, centerpieces, bridesmaid dresses…the list goes on! Plus, our LED lights do not get hot like traditional halogens with gels, so you won’t have to worry about curious little ones getting too close. Also, since our LED technology doesn’t require much power, we can place them anywhere, with no worries of possibly overloading a circuit or blowing a breaker! Ask us about our completely wireless option as well! 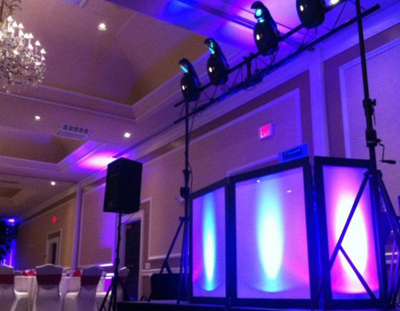 Really add a WOW factor with our LED lighted DJ booth option! Our LED backlit facade hides the traditional skirted banquet table and gives off an incredibly cool vibe! Want to set the party atmosphere? Add intelligent lighting to really wow your guests! We’ll bring along 4 intelligent lighting fixtures, mounted on a 10’ trussing system! Want to go all out? We can project any image, logo, or slideshow onto our 50″ LED HDTV screens during your reception. We can also mix in music videos on our state-of-the-art DVD turntables! It’s at the cutting edge of today’s DJ technology! We can actually become VJ’s for you and your guests! Also, ask us about our new Flyboost social media technology where guests can Tweet or Instagram pictures to the TV’s using a designated #hashtag! This is one aspect of our DJ business that certainly makes us unique! 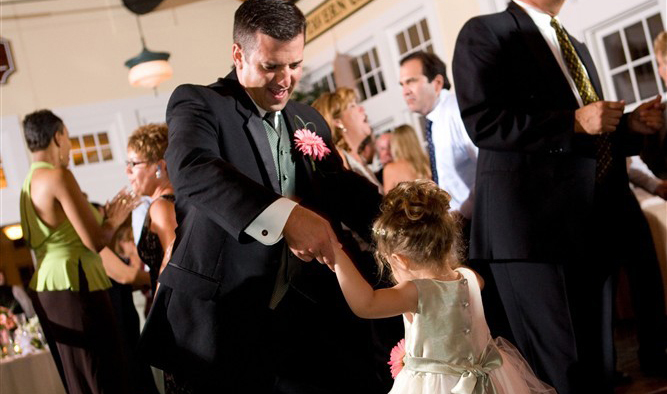 Does your first dance song seem too long? Would you like a custom edit of your special song that shortens the length? Or maybe you would like a custom mini-mix of a few dance tracks mashed together? Here at Beat 2 Beat DJs, we have you covered! Our talented team has plenty of hands-on experience editing and remixing audio (and even video as well). While our actual fee will vary depending on the complexity of the individual request, most simple edits are only $95. We can record our performance live on the fly as one continuous .mp3 file! You will receive a high quality, line-level recording of everything – speeches, toasts, and of course all of the music! Please note that all prices are subject to change. Be sure to contact us for current pricing information. Beat 2 Beat DJs takes great pride in being chosen to provide the musical entertainment on your special day. All of our DJs are extremely talented, but we also realize that your wedding reception is all about YOU! It’s not about our ability to mix and scratch (although we certainly can if you would like! ), it’s all about keeping you and your guests happy and having the time of your lives. Rest assured, we will do everything possible to keep YOU happy on YOUR day!